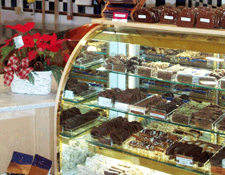 One visit to our store and you’ll discover why Rocky Mountain Chocolate Factory is the number one destination of chocolate lovers everywhere. Throughout our store you will discover a fantastic variety of yummy chocolates and confections to satisfy cravings of even the most ardent chocoholic! Watch as we dip crisp apples in thick, bubbling caramel from a traditional copper kettle. Smile as we roll them in a rainbow of tasty toppings to complete your old fashioned treat. Linger awhile longer and learn how fudge is made as we fashion a creamy loaf on a traditional marble slab, the old fashioned way, right before your eyes. And of course, everyone gets a free sample! But don’t leave without sharing your experience with a gift of fine chocolate, elegantly crafted and beautifully packaged in boxes, tins and baskets. We invite you to explore our site for product information, special offers or news and events. And when you’re ready, give us a call or stop in. We’ll keep the kettle cooking for you!